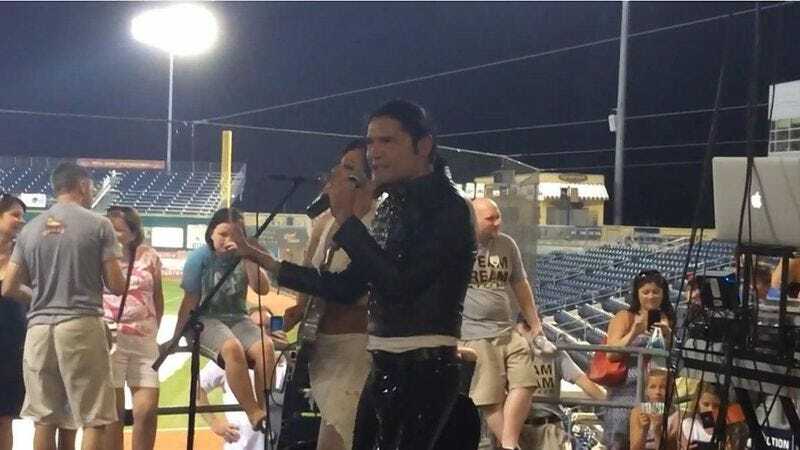 Sending the implicit message that minor league baseball is no place for grown men sadly trading on teenage glories, Pennsylvania’s State College Spikes made national news Monday when it issued a statement apologizing for an appearance by Corey Feldman at Sunday night’s game. Feldman, whose presence normally requires a $250 fee up front or being a girl in your underwear, had graciously waived those prerequisites in order to sing with his band of “Corey’s Angels” after the Spikes left the field. And it had all the makings of a classic American summer night: the crack of the bat, the roar of the crowd, and The World’s First All-Blonde Lingerie Model Female Band, standing in the vicinity of Corey Feldman while he performed. And perform he did, cavorting with his scantily clad women and delivering Michael Jackson-inspired dance moves, and generally proving that he was, indeed, Corey Feldman—which is all anyone asks of him, or of anyone. Feldman also compared the experience to “working [with] The 3 Stooges,” a comedy team known for its hilariously poor event planning. He then laughed. He laughed right out loud. On Tuesday, Spikes general manager Scott Walker clarified the apology saying, “We are not apologizing for the content of Feldman’s performance.” According to Walker, the team apologized because Feldman didn’t do what he was expected to do — meet with fans, appear on the field and sign autographs during the game. In addition, the Spikes weren’t originally expecting Feldman’s appearance to include a musical performance. And Walker says Feldman didn’t sign autographs until after he finished singing, long after that night’s game had ended. While the belief that you probably won’t hear Corey Feldman perform any music is commonly shared, it’s also one that Feldman has been putting the lie to since at least the early ’90s. And in a corresponding statement, Feldman’s management company denied Walker’s claims that they weren’t expecting it, saying that Feldman had done “everything that he was contracted and agreed to do”—even after learning that he’d been downgraded from a suite to a single hotel room. Like his song says, you must let such things go and ascend. Furthermore, some attendees have already crowded the Spikes’ Facebook page, chastising the team for degrading what they call the “amazing experience” of waiting half an hour in line to meet Corey Feldman, in the wake of a Corey Feldman concert at a minor league baseball game. In other words, the definition of “expectation” continues to be very fluid and subjective.